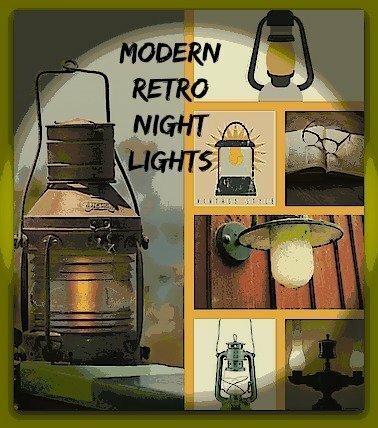 Vintage style retro night lights with their old school designs will give any room the long ago ambiance. The retro night light lamp lighting up your hallway gives out a warm feel and loving memories of years gone by. The retro bedside table night lamp with motion sensor that switches on with just a wave of the hand is really great when getting up in the middle of a dark night. Night lights from the 1950s, 1960s etc. sure do make a nostalgic statement in any room that you put them. The retro night light table lamp adds elegance and old fashioned charm to your decor. Use the retro night light in your bathroom for those night visits – casting a soft gentle glow so that you’ll not miss your steps. Yes, these make wonderful gifts for retro collectible lovers. Yes, they add an element of vintage beauty to your room decor. This retro oil lamp design reminds me of the 1950s style kerosene oil lamp that my grandmother had. It used to cast a flickering glow that I had found comforting in the dark bedroom that I had shared with her. This antique style bedroom oil lamp comes with modern features such as energy saving 0.3 watt LED light, USB charging cable (included) and rechargeable built-in batteries. Just like the traditional kerosene lamp of old, you can blow out the light. A gentle blow into the lampshade will switch it on or turn it of. However, you’ll have to turn it on first for this to happen. Another similarity to the old style kerosene lamp is the dimmer feature. You can adjust the brightness by turning the dimmer knob just like grandma used to do. With its DC 5V USB port and the included USB charging cable, you can connect the lamp to your computer, power bank or USB adapter. It has a portable folding design which makes it easy to take it along on your camping trips or hiking in the wilderness. The lamp measures 8.66″ in height and 3.54″ width at the base. Unlike the breakable glass lampshade of the olden days kerosene lamps, this retro style night lamp has a tough and impact resistance ABS plastic lampshade. The materials used are ABS plastic. Do not worry about the operation as you’ll get a manual with the package. It’s easy to operate with just an on/off switch as well as the dimmer control knob. The traditional vintage Tiffany lamp has a lampshade that is made of stained glass. This particular Tiffany lampshade is handmade using 80 pieces of glass and 60 decorative glass beads. The glass is manually cut resulting in irregular shapes lending to its uniqueness. The base is made of zinc alloy. You can use E27 type A bulb with maximum wattage 40. Warm color bulb is recommended. (You’ll need to buy the bulb separately). The on/off switch is located on the power cord. Traditional Tiffany lamps come with soft warm lights. This elegant stained glass retro lamp will look lovely as a table lamp or your bedside night lamp. It exudes the traditional feel, reminding me of the countryside. The height of the lamp is about 14″ while the diameter of the lamp shade is about 8″. The shape of this round bulb lamp reminds me of the circular light bulbs of my childhood days. Those were warm and glaring, unlike this retro bulb lamp. The LED bulb is housed in a circular PVC shade sitting on a metallic base. You get to switch on the lamp by pressing the retro looking lever switch. You can choose between warm or multi colors. It comes with built-in rechargeable 300mAh lead-acid battery. You can charge it (takes about 2 – 3 hours) using USB, lap top or power bank to recharge. The LED lamp beads have a long life of 14 – 28 hours. Being wireless makes this vintage LED light bulb lamp very portable and convenient to use. The shape is almost like the traditional vintage kerosene lamps. This vintage kerosene shaped retro night light uses a built-in 400mAh environmental lithium battery to light up the lamp. LED life span is about 30000 hours. Once you’ve fully charged it for 3 hours, it’ll stay lighted for about 8 hours. You can charge it through a USB output port such as your computer or power bank. Another way would be with a power adapter. The USB charging cable is included. You turn it on or off by blowing into the shade just like blowing out the flame of the traditional kerosene lamp. There is a dimmer control knob to control the brightness. It stands at a height of 7.50″ and has a width of 3.20″. The weight is 453gm. You can get it in red, green or blue colors. A retro style vintage night light adds ambiance as well as light to your room. It brings out nostalgic memories of years gone by. Besides, they look cute and lovely as decorative night lights too. And of course, retro night lights make awesome nostalgic gifts.